Proper storage of your school's band and orchestra instruments will not only prolong their lifespan, but prevent theft, vandalism and improve a room's flow of traffic. There are a few things to consider before you purchase storage for your instruments, namely: room temperature, dimensions and material. Instruments should always be stored in an indoor, climate-controlled space – preferably between 65 and 72 degrees, with humidity between 35 and 50 percent. This typically rules out basements, attics and outdoor units as viable storage options. Extreme heat or cold can cause cracking, warping or corrosion to any instrument. Storing your instruments next to radiators or other heat sources – even indoors – can be detrimental as well. Keep in mind that instruments should be stowed away in their cases and broken down (if necessary). If you're planning to leave an instrument in storage for extended periods of time, it's best to add a layer of acid-free tissue paper in between the instrument and the case lining, as even lining can cause damage over time. People often underestimate the space they need to properly store musical instruments. 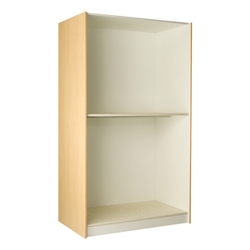 Often, you'll be able to find the types of instruments a storage cabinet can hold in the product specifications, which makes purchasing easy. If you're not sure, call the manufacturer, and be sure to measure your space before you purchase a cabinet. 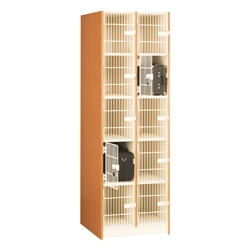 Instrument storage units are commonly made of plywood, laminate, metal or a combination of the three. Plywood (like laminate) is easy to clean, durable and often budget-friendly. Metal is exceedingly strong, long-lasting and offers a more contemporary look. Be sure to check the weight capacity of the storage unit you purchase. Look for features like bolt-through construction and heavy-duty hardware, which will ensure that your piece stands up to daily wear-and-tear. Do you need locking doors, or casters for easy mobility? What about adjustable shelves? If you're planning on moving instruments from space to space, you'll want heavy-duty, locking casters. If theft or vandalism is a concern, opt for locking compartments.